15th match of ICC Worldcup 2015 has been played between West Indies and Zimbabwe at Manuka Oval, Canberra today. West Indies with extra-ordinery knock by CH Gayle 215 runs and MN Samuels 133* runs managed to put very huge score of 372 runs after 50 overs. Zimbabwe all out scoring 289 runs and lost the match by 72 runs. CH Gayle declared man of the match for his record breaking 215 innings of ICC Worldcup. Earlier, West Indies won the toss and decided to bat first. West Indies lost DR Smith on 2nd ball of very first over. 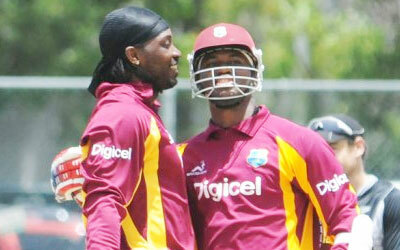 MN Samuels joined with CH Gayle and played extra ordinery inning of ODI cricket. Both added record 372 runs for 1st wicket. CH Gayle out on last ball of inning scoring 215 runs just in 147 balls with 10 fabelous fours and 16 massive sixes. MN Samuels also contributed 133* runs with 11 fours and 3 sixes. West made highest totals of 2015 ICC Worldcup with 372/2 runs. Following very big target of 373 runs, Zimbabwe lost top 3 wickets in 46 runs. Zimbabwe middle order batsmen played their level best but, could not reached at West Indies totals and all out scoring 289 runs in 44.3 overs. West Indies registered comprehensive win by 73 runs (D/L).